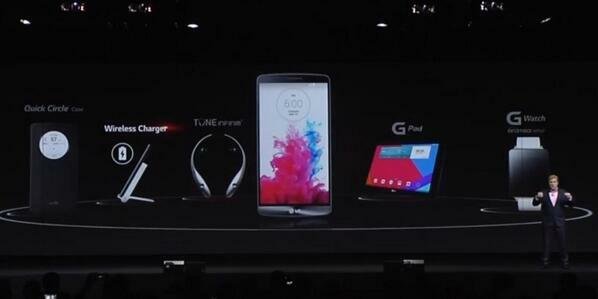 That the G3 smartphone will be announced by LG at today's event hasn't really been a secret. As a matter of fact, the company hasn't even tried to hide this fact, as LG itself recently declared that we're indeed going to witness the advent of its latest and greatest invention today, on May 27. And boy is this a phone we're so looking forward to! All evidence points at the fact that the G3 will succeed the super-thin-bezel design of its predecessor, making for an impressively compact device, considering the massive display it's expected to employ. This is where it gets very interesting, as LG has already confirmed that the G3 will up the 5.2" display size of its predecessor to the gigantic 5.5 inches. Couple that with the fact that this phone isn't expected to be substantially bigger than, say, a Galaxy S5, and you can see where our excitement is coming from. What's more, the screen is actually said to have a processor-freezing QHD (1440 x 2560 pixels) resolution - a resolution level that is yet to be proven useful in a smartphone. Of course, the usual silicon suspects are also on board, with the Qualcomm Snapdragon 801 chipset proudly running the show behind the scenes. The even where LG is going to take the wraps off the G3 is going to take place soon. Stay tuned to our liveblog if you want to receive constant updates about the development of the show, or, if you'd prefer, head over to our livestream post to watch the action on video! 12:59 Thanks for being with us, guys! But stay tuned to PhoneArena.com, because we have a ton of G3 coverage coming up! 12:59 Well, it looks like this is it... We guess pricing will be flagship like - around $650 at launch, but we'll see. 12:57 "Get ready for something totally different. You've never seen anything like it before. Simple is the new smart." 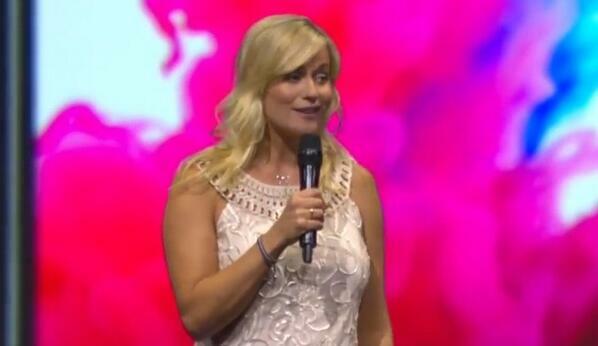 12:56 "You can see that with new LG G3, simple is the new smart." 12:55 "Just say Ok Google, to ask questions and get stuff done" - with the G Watch. 12:54 G Watch is there as well, in case you've been wondering. 12:54 "Last but not least, every Batman needs his Robin." Accessories are next on the line. 12:53 That's where the Kill Switch comes in - it lets you remotely shut the device down and lock it. 12:52 "What if someone decides that they like your LG G3 a little bit too much?" 12:51 Knock On is still on board of course - just double tap the screen to have a glance at the lockscreen. 12:51 Coughlin is now talking up the Knock Code unlock feature yet again - LG is really pushing this thing hard. 12:50 Three core security measures: Knock Code, Content Locker and Kill Switch. 12:49 Next on the line - Smart Security! 12:49 "How to make your smarter with G3 - just enjoy!" 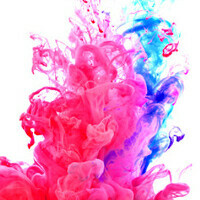 12:48 G3 informs you through smart cleaning about any unused files or redundant data that could be cleaned up. 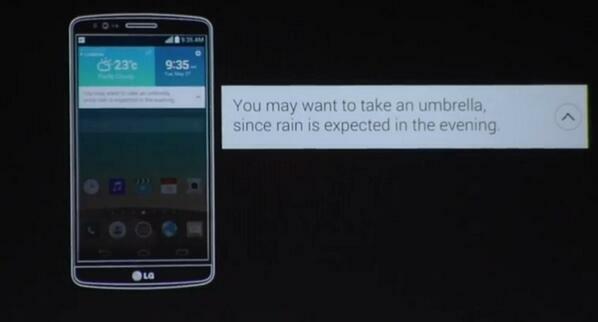 12:46 Smart Notice will offer pro-active suggestions to users, similar to Google Now. Smart Notice is like a personal assistant. 12:45 "With Smart Notice, we didn't want to reinvent the wheel." 12:44 "How to stop typos on G3? Just type!" 12:44 "Testing shows that overall the improvements incorporated in the G3 Smart Keyboard enhance speed with more than 70%"
12:42 "With G3, LG has redesigned the input method." 12:41 "When you're using a typical QWERTY keyboard, you may notice how much your thumbs move around it." 12:41 According to a Nielsen study, says Andrew, typing is the number 1 activity with a smartphone. 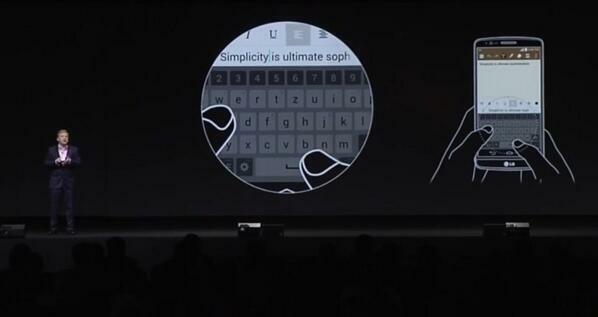 12:40 Three new features: Smart Keyboard, Smart Notice and Smart Security. 12:40 Andrew Coughlin is on stage to talk about user experience. There it goes. 12:39 LG is now rolling a video that shifts gears towards the software features side of things. Smart Keyboard, Knock Code, and Smart Notice. 12:37 There's a matte overlay on the back designed to get rid of fingerprints. 12:36 The LG G3 features gentle curves on the back - an effort that aims to make the phone feel comfortable in the hand. 12:35 "Mature feeling colors" - LG has tried to avoid childish primary colors, and instead go for a more grown-up look, despite the simplicity. 12:33 "At the foot of the device - a flash of color." "This stylish finished continues on the inside - the refined LG UI, the colorful wallpapers"
12:32 "Our goal was to create a design that not only looks great, but also feels great." 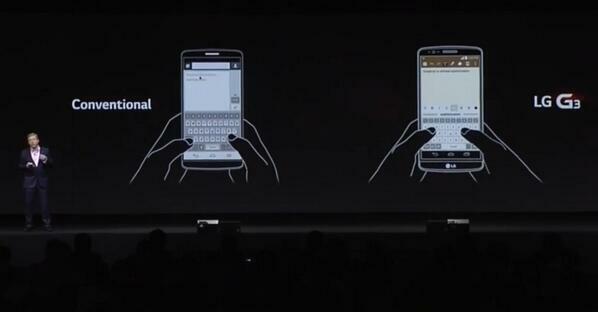 12:32 Finally, we'll now go through the improved design of the LG G3 and its rear keys! 12:30 The G3 will try to deliver better audio recording, even when you're in noisy night clubs. Quite handy! 12:29 Large sensor, better lens and F 2.0 aperture. Unfortunately, they don't specify just how big the sensor it. 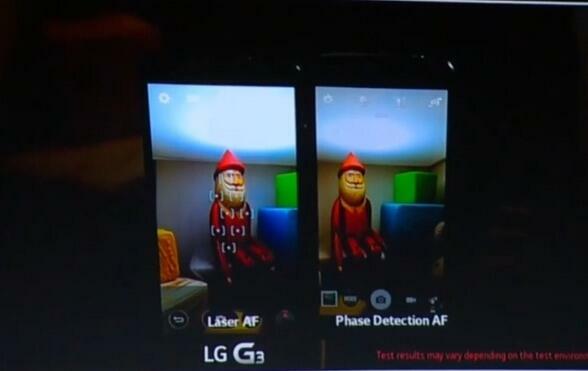 12:27 LG G3 features the company's OIS+ tech - optical image stabilization for photos that turn out less blurry. 12:26 And there goes a comparison against the GS5's phase-detection AF. 12:25 "In order to never miss a moment, fast focus is essential." 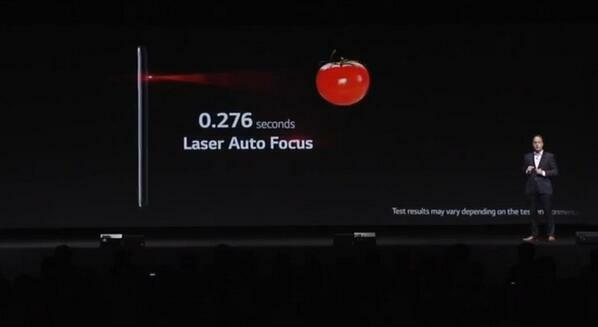 This explains the new laser focus tech found in the G3. 12:23 LG has achieved a great screen-to-size ratio - more than 76%, meaning that it will house its massive 5.5" screen in relatively compact size. And then suddenly PA disappears from the web. It makes sense since both Sony and Samsung's flagship have "Prime" edition. Just wait and see, time will tell. Why don't I wait? Because it's a truly super overpriced phone that will not have any useful variety compared to these beasts. I'm starting to play a small game right now. I'm more excited bout the G3 mini now.oh wait!! !, isn't that released already as the G2! ! Where was PA when Z2 was about to announce? So much articles of G3 already.. Anyway G3 looks promising than S5..
Nvidia has announced that they are quitting mainstream mobile market, so we would rather not have tegra. Future support would be bad. 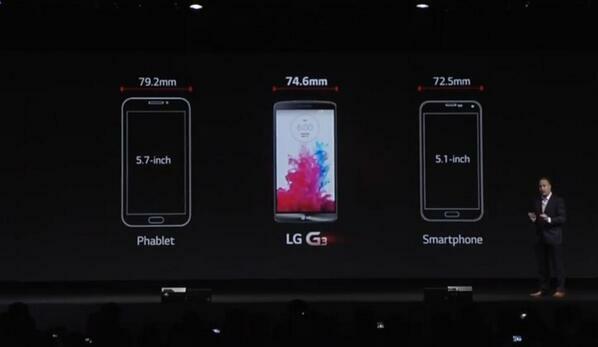 The LG G2's display is 5.2" and its 138.2 mm tall and the LG G3's display is 5.5" so shouldn't it be 141.2 mm tall instead of 146 mm? LG could've done better keeping the dimensions to a minimum. No. 5.2" display : 115.2*64.8 On the G2 LG added 23.3*6.1 mm of bezels 5.5" display : 121.8*68.5 On the G3 LG added 23.8*6 mm of bezels LG added 0.5mm of bezels in legnth and reduced 0.1mm in width It's pretty much the same bezel overall. 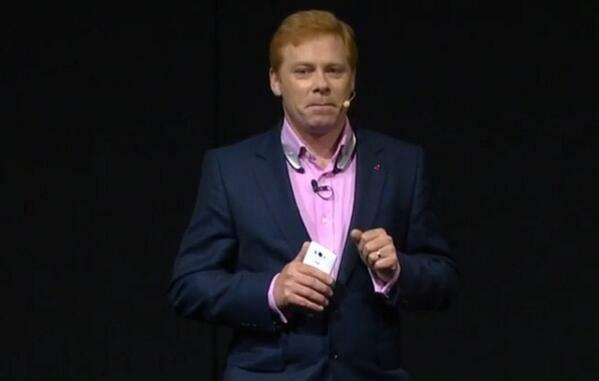 for the very first time a LG phone can attract attention from all around the world. please mind your price tag as China brand smartphones are getting stronger and cheaper. if you do well, next year is yours, LG. No pricing or release date? That bites, I need my 32 GB variant!